The researchers conclude: "These findings highlight the relative susceptibility of children to the experience of presence in simulated environments and may have important consequences for pedagogical and educational interventions. One consequence might be that one should be more reluctant to expose children to emotional virtual stimuli as currently practiced." This overwhelming effect in children may not be all negative, but it underscores potential dangers. 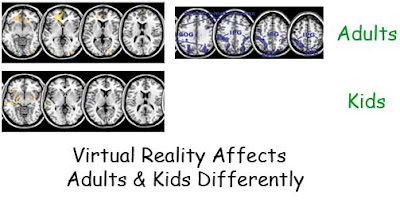 Interestingly in other studies, virtual reality has shown promise in ameliorating pediatric burn patients' perception of pain and treating of generalized anxiety disorder. In both these situations, immersive positive virtual environments have therapeutic effects.